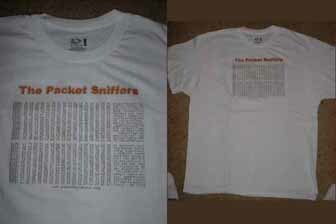 Now is your chance to own one of these unique, priced to own Packet Sniffers T-Shirts! These are high-quality Fruit-of-the-Loom shirts which we make by hand using a trade secret process to extend the life of the artwork. Editor B of ROX was the logo designer of our shirts. Shipping Free shipping for sticker only orders, T-shirt orders add $2. We don't have a fancy web based shopping cart for taking orders, it's email only for now. Just click the "Order Here" link below and tell us what you want, we'll get back with you within a day or so. Currently we accept paypal only. If you can't use paypal, let us know and we can try to work something else out. Remember, never send confidential information clear-text over the internet (Like an email). We can't process credit cards and we can't draw from bank accounts, please don't send this information to us.